Bruce Barber, Serge Guilbaut and John O’Brian, eds., Voices of Fire: Art, Rage, Power and the State, Toronto, Buffalo, London: University of Toronto Press, 1996, 212 pp., ill. b. & w. & col. This volume brings primary sources from the Voice of Fire controversy (cartoons, press clippings, radio and television transcripts) together with essays on the altercation and Barnett Newman’s work. In doing so, it shows how the sound bite that initiated the controversy (Felix Holtman’s “two cans of paint and two rollers and about ten minutes would do the trick”), while rather banal, instigated a series of provocative questions: Is fiscal restraint as important as the independence of cultural experts? Would the National Gallery best galvanize Canadian identity by promoting Canadian culture, or by collecting the world’s best art? How do we feel about having national identity moulded by an institution that operates independently of public opinion? 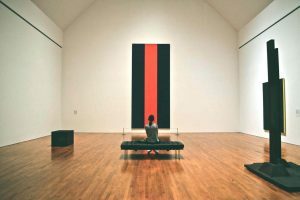 What do we think of the claim that there is a “best” in art? These queries are particularly interesting because they came, often with subtlety and insight, from an extraordinarily wide public. Voice of Fire is a costly work of American “modern art,” and its purchase provoked outpourings of anxiety regarding government spending, mandarinism and national identity. But these outpourings came from very distinct constituencies. Holtman and the Canadian Artists’ Representation (CARFAC) both had concerns: the MP thought the acquisition was an extravagance, CARFAC that it downplayed the importance of Canadian art. The salient point is that opposition to the purchase was not exclusively the province of boorish, anti-government xenophobes. This book’s usefulness, then, is that it invites us to think about the responses as heterogeneous, and to resist the temptation — a strong one, as one editor notes — to dismiss all of the antagonism as ill-informed, uncultured buffoonery.